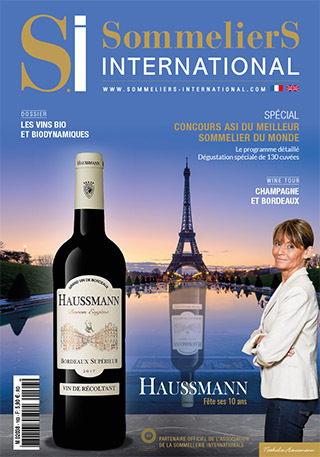 At the beginning of this year, the “Bistrot du Sommelier”, on the Boulevard Haussman in Paris, welcomed another tasting organised by Sommeliers International, this time dedicated to Cahors wines. At the invitation of Philippe Faure-Brac, Master of Ceremonies for the day, this tasting was in a way a tribute to Malbec, a legendary grape variety currently making an impressive comeback. On Monday 4th February, sommeliers of the Parisian Sommelier Association (ASP) and their guests were delighted to meet to carefully taste and scrutinise approximately 70 wines. All were presented in brand new Malbec glasses provided by the UIVC (Cahors Wine Trade Union). They are extremely aesthetic, with a ring on the stem, symbol of communion with the wine. Utmost care was devoted to the design of these glasses to ensure they are perfectly adapted to tasting their favourite grape variety. In response to the invitation extended by Philippe Faure-Brac and Jean-Luc Jamrozik, numerous personalities of the sommelier world were present: Alain Delort, assistant treasurer of the Parisian Sommelier Association, Tony Moinnereau, David Cobbold, Christian Denolf, Eric Rosenberg, Sébastien Pradal, Jean-Charles Beguet, Jean-Pierre Jolu, Laurent Marre, Gérard Schneider, Jacques Boudin, Jacques Maubert, Jean-Noël Demarne, Jean-Claude Sarre, Amandine Poinsot, Rémy Vincent… not forgetting Manuel Peyrondet, a promising French candidate.Place of honour for the South-West…So, what was the general observation? “Over the past fifteen years, Cahors has progressed more than during the previous fifty”, exclaimed in unison the numerous sommeliers who attended this event. The main subjects of discussions were technical innovation, vine growers’ enthusiasm and enterprise, as well as the revival of the appellation. Château Cantelauze, Clos du chêne, Domaine La Bérangeraie, Domaine de Fantou or Cosse Maisonneuve… The sommeliers had the pleasure of discovering a marvellous range of samples, all representative of the appellation. They all agreed in acknowledging the excellent standard of these pure wines, characterised by a certain balance between tradition and complexity. Philippe Faure-Brac, Jean-Luc Jamrozik, Manuel Peyrondet, Mona Kalif, Alain Delort, Tony Monnereau. “We can sense that the Cahors appellation is pursuing its development with more elaborate, sophisticated wines, whilst preserving the identity of its terroir and grape variety”, noted Philippe Faure-Brac. Characteristic features and authenticity: these were the two main qualities that everyone anticipated and were delighted to find intact and more than ever present now than in the past. Laurent Marre, sommelier at ‘Le Balandre’ restaurant in Cahors, expressed his satisfaction with this revival. “This tasting really gives a true reflection of what is happening at present in the appellation. Without any notion of complacency, several standards of wine are represented in terms of quality and pleasure. Numerous young winegrowers came to support Cahors’ great classics (Château Pineraie, Le Cèdre, Château Lamartine, la Caminade…). The new generation of winegrowers deserves to be commended; they are attempting to encourage progress by implementing a strategy that aims to achieve excellent quality.” This approach is found for Vins de Pays, and for the wines of Domaine de Belmont, for which the wine-maker seeks to convey a terroir expression combined with increasingly skilful maturations. Eric Allouche, Laurent Marre, David Cobbold, M. Costa, Jacques Boudin, Gérard Schneider. The drive and enterprise of the region is provided by its winegrowers, who gladly innovate and draw inspiration from their oenology studies and their travel experiences, to bring increasingly sophisticated techniques to their wine-making …: selection of plots, production of wines in accordance with varying terroirs … Labels are also innovative (for example the CQFD label of Clos Trotteligotte …), showing efforts devoted to the aesthetic quality of the product, providing a fresh, new image for the Cahors winegrowing area. Gérard Schneider, sommelier and member of the ASP, stated that he was also pleasantly surprised by the quality of the wines he tasted. Impressed by the youth of the winegrowers who came to the “capital” to promote their wines, he was delighted by this enthusiasm, which is such an excellent indicator for the future of Cahors wines. There is significant progress in the approach taken by winegrowers and acknowledged quality in a completely modern return to tradition… “Winegrowers want to develop the appellation without misrepresenting it. We find in these wines the characteristic features that the older generation lost by favouring the production of high-volumes and easy-drinking wines”, summed up Gérard Schneider. The tasting also included a selection of Bordeaux great growths, whose fine quality is unvarying (Château Rauzan-Ségla, Château Dauzac, Château Canon, Château Bernateau, Château Jean Faure), as well as some splendid revelations (cuvee Dame de Coeur from Godeau-Bouey estates; cuvee La Joly from Raymond estates in the Côtes de Bordeaux Saint Macaire appellation; La Rivalerie; Château Maugey …) Accompanying these wines were some outstanding Sauternes (Clos Haut Peyraguey, Château des Arrieux cuvee Robin, Cru d’Arche Pugneau…) and a reputed Saint-Estèphe, Château Plantier-Rose. Amongst spirits presented, a few marvels (Cognacs Voyer les Grandes Terres, Cognacs Amart & Audry) were tasted alongside an amber-coloured, round flavoured plum eau-de-vie made by the Louis Roque distillery and a magnificent Armagnac (La Folle Blance 1973 from the company Millésimes et Traditions). In conclusion, and according to all present, this event was an occasion to once again pay due honour to Malbec and it was also a celebration of three leading products: the wines of Bordeaux and eau-de-vies made in South-West France. Motivated by the reasserted passion of enthusiasts, Cahors wines now succeed in being surprisingly excellent. Fine Bordeaux wines continue to delight tasters’ palates and Cognacs and Armagnacs truly seem to be making a strong comeback!